Rubber expansion bellows are the solution to thermal expansion, shrinking and/or vibration movements. These circumstances normally result in stresses, which cause noise and eventually damage to machines in work environments. 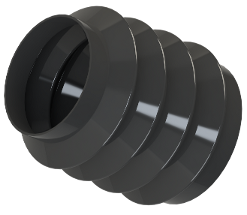 In order to prevent these noises or stresses from occurring, we provide rubber expansion bellows that fit perfectly and are suitable for the concerned pressure and temperature and movement limits. We have a wide range of rubber expansion bellows that can be used in many different industry segments. Due to their characteristics rubber expansion bellows are often used in the food industry and in other industries. Since selecting the right rubber expansion bellows is a difficult task, we have developed an on-line bellows selector to support you. All you need to do is enter the diameters and overall length of the bellows you require. We have most of our rubber expansion bellows in stock. For more information about our rubber expansion bellows, please contact us by filling out the ‘ASK ERIKS’ form or by calling your nearest ERIKS location.